Italian Air Force fighter jock becomes fully-qualified F-35A IP at Luke AFB. An ItAF combat pilot has recently become the first Italian F-35A IP (Instructor Pilot) with the 56th Fighter Wing at Luke AFB, Arizona. The Italian IP has got the qualification to train Italian and partner nations pilots on the Joint Strike Fighter through a 6-month syllabus made of two distinct classes respectively called “Transition” and “Intructor Pilot Upgrade” (IPUG). During Transition the pilots train in various forms of flight: air-to-air combat, air-to-ground missions including SEAD/DEAD tasks (Suppression / Destruction of Enemy Air Defenses). At the end of this stage, the student IPs have gained skills to fly these missions in all-weather conditions. During the subsequent IPUG class, the students are taught how to teach follow-on pilots to fly and fight in the F-35A. The IPUG course ends with a check ride required to achieve the IP qualification. 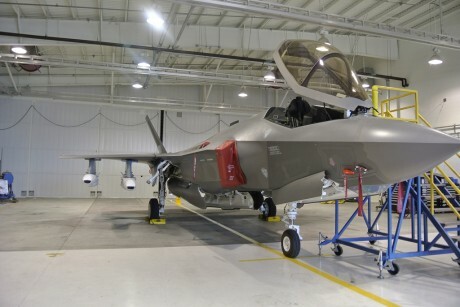 The syllabus has become more focused on full combat training last Spring, as the U.S. Air Force prepared to declare the F-35A Lightning II ready for war by the U.S. Air Force with the 34th Fighter Squadron based at Hill AFB in Utah (that eventually achieved the Initial Operational Capability on Aug. 2). The newly qualified Italian IP will serve in the multinational pilot training center at Luke AFB in Arizona, the world’s premier conventional F-35 training base where, under a pooling arrangement, USA, Australia, Norway and Italy, share IPs and aircraft to train new pilots and instructors within the same standardized framework. The U.S. Air Force F-35A is ready for war. More or less. David Cenciotti is a freelance journalist based in Rome, Italy. He is the Founder and Editor of “The Aviationist”, one of the world’s most famous and read military aviation blogs. Since 1996, he has written for major worldwide magazines, including Air Forces Monthly, Combat Aircraft, and many others, covering aviation, defense, war, industry, intelligence, crime and cyberwar. He has reported from the U.S., Europe, Australia and Syria, and flown several combat planes with different air forces. He is a former 2nd Lt. of the Italian Air Force, a private pilot and a graduate in Computer Engineering. He has written four books. Russian Su-27 buzzes U.S. RC-135U spyplane. Once again. Send me an email if you want to support this site buying the original TheAviationist.com patch, only available through this website! Patch on velcro. New Chinese Media Campaign Rolls Back Curtain of Secrecy on Their Air Forces. Contents of this blog/website may not be used withour author's prior written permission. All rights reserved.